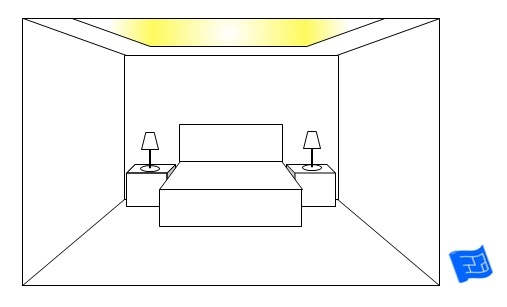 This page is a collection of bedroom lighting ideas for you to look through and choose the ones you'd like in your bedroom lighting design scheme. The simple drawings aim to simplify the concepts and there's a bit of discussion about each option. It's all part of the home lighting design series here on House Plans Helper. 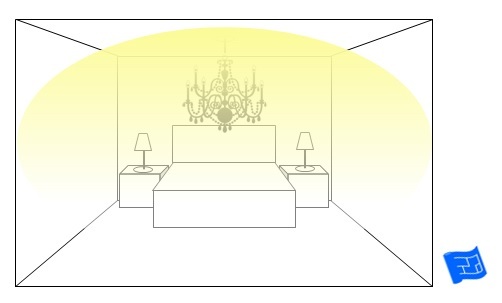 First of all let's have a quick think about the lighting requirements in a bedroom. 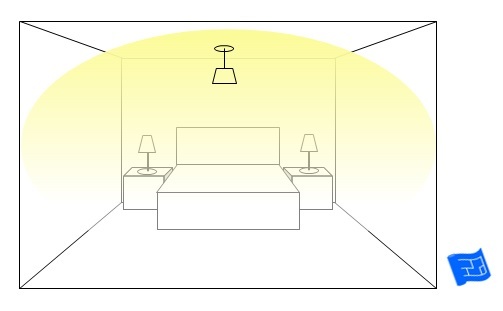 Have a think about how you like the lighting when you're falling asleep, getting up during the night and waking up. Do you read in bed? What lighting works to get you in the mood? 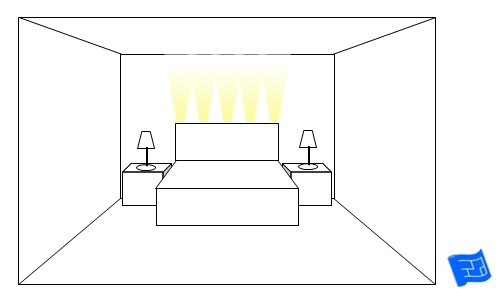 Do you carry out any grooming activities in your bedroom that would have lighting requirements? We'll look at ambient, task and feature bedroom lighting ideas. 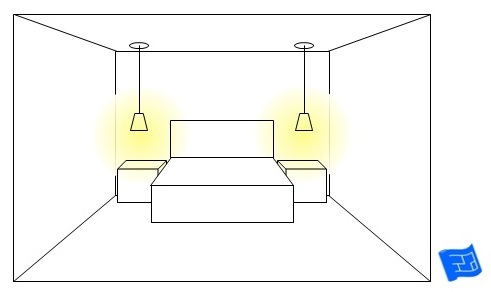 We'll start with the feature lighting options because they tend to be least obvious ideas. 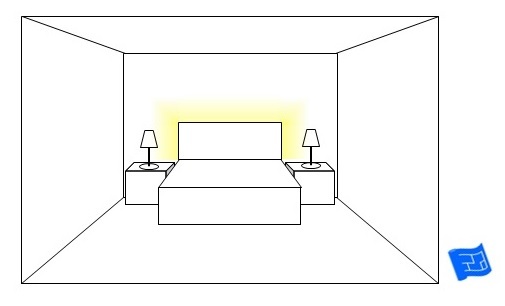 Let's start with feature lighting around the bed. What would a soft glow around the headboard do for your bedroom lighting design scheme? The headboard glow can be achieved by installing LED lighting strips behind your headboard. I'd go for a nice warm light. If you have the opportunity to construct a built-in headboard, installing uplights can really accentuate the bed as a focal point. A glow from under the bed or under the bedside tables might suit a more modern design. 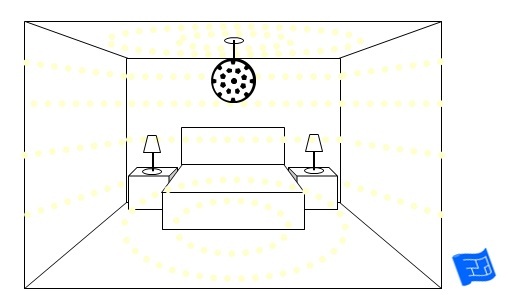 It's an idea to have some floor level lighting in a bedroom so that if you wake up in the middle of the night and need to get out of bed you can flick a switch for the floor level lighting which should be just enough to light the way without disturbing your partner. 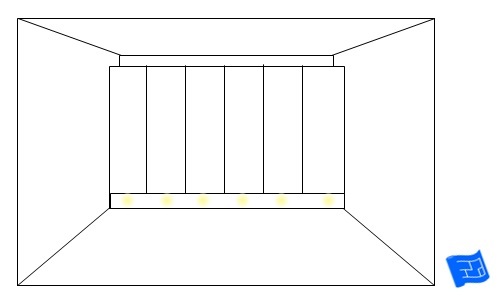 The next picture shows a box that's been put in at ceiling level featuring three downlights that could be used to light the wall or equally the bed below. 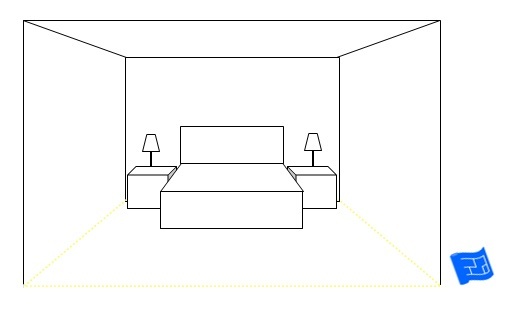 The box also makes the area around the bed feel welcoming and sheltered. 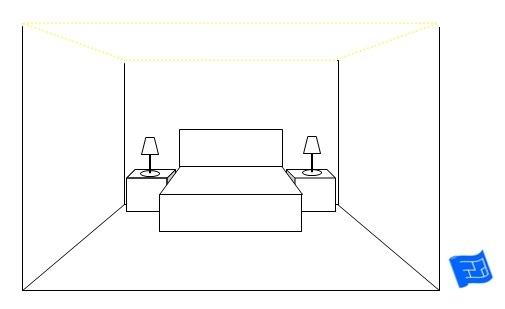 You could equally install a box all the way around the bedroom and install downlights. It's a great way of retro fitting ceiling lighting in any room without interfering with the ceiling and floorboards. A strip of LED lights over the wardrobes sheds a glimmer onto the ceiling. Directional downlights placed slightly forward of the wardrobe and angled towards the wardrobes will highlight the finish of the wardrobes and make it easier to see what's inside with the doors open. 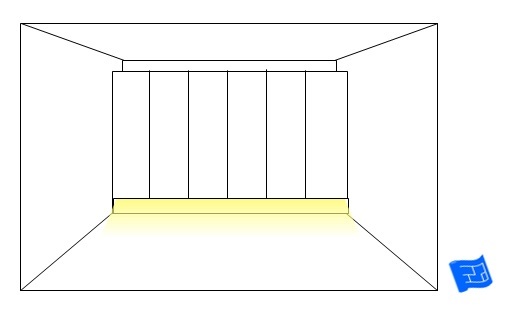 LED strips under the lower lip of the wardrobes radiate over the floor. I think floor lighting has a very calming effect, it kind of says 'just relax'. 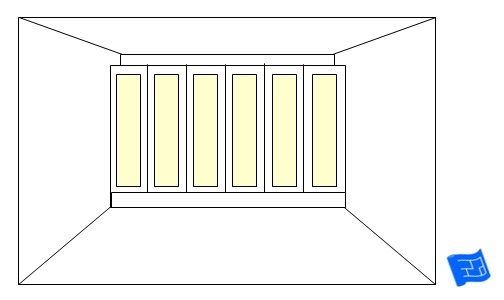 An alternative to LED strips would be to install small individual LED bulbs within the toe kick of the wardrobe. We've already talked about the merits of floor level lighting for getting out of bed in the night above. I have come across wardrobes with patterned or frosted glass set in the doors. This provides an opportunity to light the wardrobes from within. And of course these lights make it easier to see your clothes when the door is open. I've put the picture here above the bed because that's the way I've set the scene for bedroom lighting. I think the best place for art in the bedroom is opposite the bed so that you can admire a lovely painting from the bed. A picture light on it's own circuit would make a real feature of the artwork. 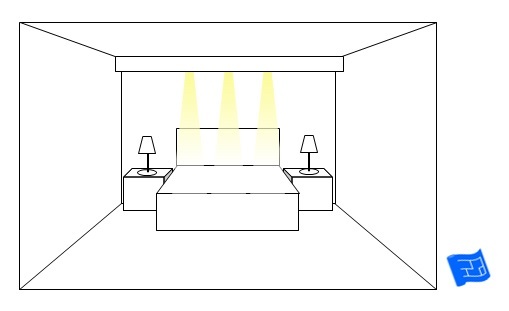 One way to come up with a lighting scheme for any room is to find things in the room which create rhythm in the design. Windows and curtains fall into this category. 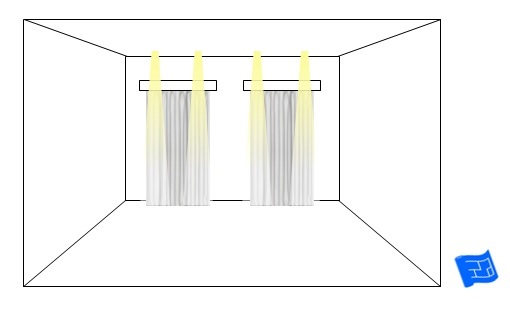 In the picture below LED strips have been installed in the curtain box to give a light wash down onto the curtains and above. An alternative would be to accentuate the rhythm of the windows and curtains with downlights placed at the sides. Or you could save on the budget and go for one light for each window with a wider beam. I think this arrangement would look slightly more balanced with display curtains and a blind or shutters behind. If there are alcoves or niches in your bedroom they are a great place to display and light special objects. Think about putting feature lighting like this on their own circuit so that you can have them turned on when everything else is dark for a dramatic effect. 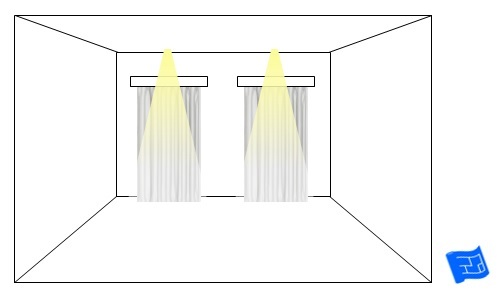 Take a look at the lighting design techniques page for more on object lighting. Rope lights can be added to a bedroom lighting design scheme at the ceiling, picture rail or floor level. Rope lights add a bit of sparkle. This rope light at ceiling height is shown in a modern design with no decoration. In a period home rope lights can be installed within or above the architrave. 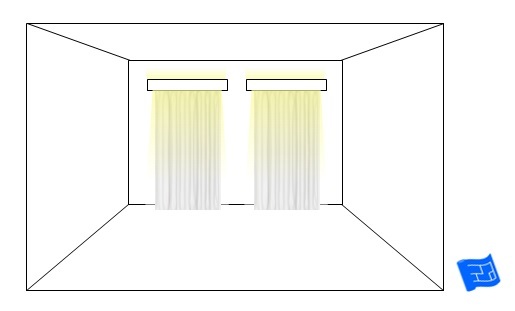 I think this rope light design would work best installed behind a thin frosted glass panel. It strikes me you could even have some fun with that - creating and oblique line of light within the wall. 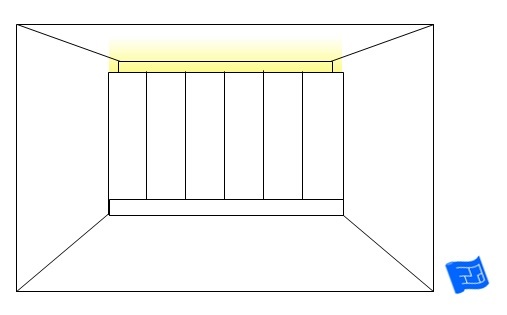 Much like ropelights at ceiling level, in older homes ropelights can be installed within or above the baseboard. Perhaps the most obvious type of task lighting in a bedroom is bedside lighting. Think about the height of the lampshade in relation to your eye level. The idea is to avoid getting glare from the bulb when you're lying or reading in bed. 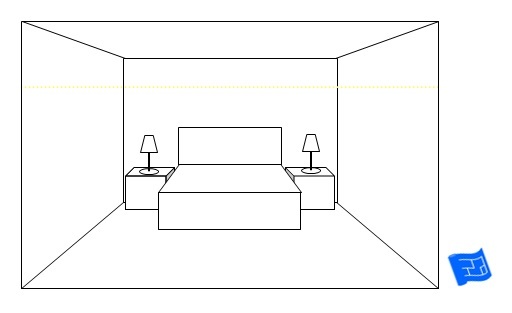 Working out the height means taking into account the height of the bed, the height of the bedside tables, the height of the lamps and maybe your height. Look for switches that can be easily reached from your bed. Often lamps with switches on the cables work best. You can easily fit a switch onto the cable if the lamps you have in mind don't have one already. I once came across a pair of lamps that shone a lovely pattern onto the ceiling. Since it's the ceiling that's the view in bed this can be an especially nice touch. You could also consider a dome lamp rather than a standard lamp. 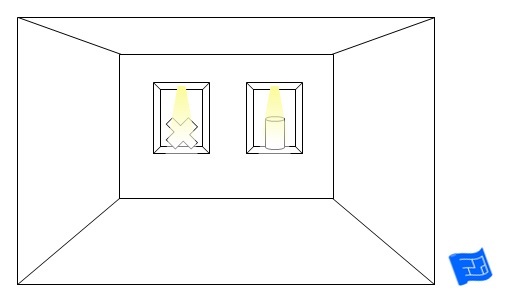 Some lamps have several different modes from dim to quite bright. This can be helpful when you need bright light for reading but perhaps a softer light to create an intimate atmosphere. If you find getting out of bed difficult in those dark winter months you could consider one of those lamps that starts lighting up at a time you specify. I guess it's a bit like a light alarm clock. Another possibility is to go for wall mounted bedside lighting in the form of two sconces either side of the bed. These have the advantage of freeing up space on the bedside locker. When you're specifying the location of your wall mounted bedside lamps think about the height of your bed, the width of your bed and the dimensions of your headboard. Make sure everything fits together. Don't forget to get three way switches installed so that you can switch off the overhead light and the wall mounted bedside lights with out getting out of bed. There are wall mounted bedside lighting options which have a reading light as well as providing general light. There's a trend these days for ceiling mounted pendant lights (with long cords) to be used for bedside lighting. This arrangement also has the advantage of freeing up space on the bedside table. 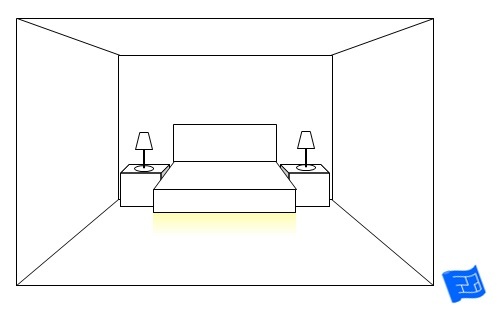 Let's finish off with looking at different bedroom lighting ideas for ambient lighting (or general light levels). A ceiling pendant is a common solution. Consider adding a baffle to the bottom of lampshades, or choosing lampshades that are spherical to avoid glare from the light bulb when looking up at the ceiling from bed. Now the picture below looks like a mirror ball. The idea I am trying to illustrate here is that a crystal shade throws a really nice pattern around the room giving a romantic feel. A flat ceiling dome is another common solution. It works particularly well in rooms with lower ceilings. A chandelier can look lovely in a bedroom. It might be tempting to put a chandelier in a room with a modest ceiling height over the bed so that bumping into chandelier won't be an issue. I once stayed in a room with this arrangement and I felt a bit uncomfortable. I realised that I found the chandelier slightly threatening. It was very unlikely to fall on the bed, and indeed it didn't, but my mind subconsciously entertained the possibility leading to the feeling of discomfort. So I would only recommend a chandelier in a bedroom with a high ceiling and that's large enough to have the chandelier hung so that it isn't over the bed. Only install a chandelier if you have high ceilings and the chandelier won't be hung over the bed. If there's budget available a dropped or coffered ceiling is a lovely feature and is made extra special with a dimmable light. It's time for me to share my Houzz bedroom lighting ideas ideabook with you. There are real life examples of some of the different lighting options we've looked at on this page. When you're looking through these think about how all the different ideas are layered together to create an overall scheme. If you have any bedroom lighting ideas to share I'd love to hear about them.